Chris Paul left the game seconds into the fourth quarter with a left abductor strain. This injury may be day-to-day and quickly healed. It also may be an ongoing issue. There's no real way to know, which is frustratingly tantalizing. Clint Capela continues to miss games intermittently with a heel issue, and the Rockets need to hope that it resolves quickly. Luc Richard Mbah a Moute continues to miss time. PJ Tucker fouled out tonight, and the hope is that trainer Keith Jones was examining his leg more as a precaution and less because of an injury. The injury bug has bitten, as it always does eventually. And with it, the streak has ended. The formula for the loss is what it was always going to be. 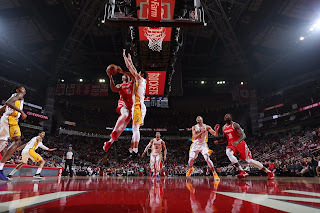 The Rockets, as a group, started the game slow, missed a lot of open looks and bunnies, and were hobbled by injury. The Lakers played like maniacs, were molten-hot from the floor, and had an incredible revenge game from ex-Rocket Corey Brewer. Even good teams lose to lesser opponents. In fact, the chances always favored that the streak would end against a mediocre or worse team, simply because there are so many of them and so few teams of Houston's caliber. Losing to the Lakers stings, but if not them it would have been someone else. James Harden did what he could. He shot 15-27 and scored 50 points to go with 9 assists. His fellow star, Chris Paul, put up a line that makes sense if his leg was troubling him: 8 points, 5 rebounds, 5 assists, and only 2-7 from the field. The big worry here is the amount of minutes piling up under Harden and Ariza. Harden played 43 and Ariza played almost 45. When missing so many pieces, and with everyone below Tarik Black in the rotation being effectively unplayable, it's hard to see this getting much better any time soon. Head coach Mike D'antoni may just have to play some G-League-level players for meaningful minutes. The Rockets may have to accept some losses to stay fresh. It stings, given the possibility of grabbing the top seed in the Western Conference, and the greased path to the conference finals that this would offer, but an NBA season is full of difficult choices. Those choices are, as many things, inevitable. The fun just ended, as it was always going to. Now, the Rockets must find out how they respond to the difficulty which arises in front of every NBA player sooner or later. Now, the Rockets have to face the inevitable. The bad news is that you can never avoid it. The good news is that what happens next is still in the air.